The Black & Decker WM825 Dual Height Deluxe Workmate has an exclusive, advanced one-handed clamp system which allows the clamps to be adjusted together or independently. 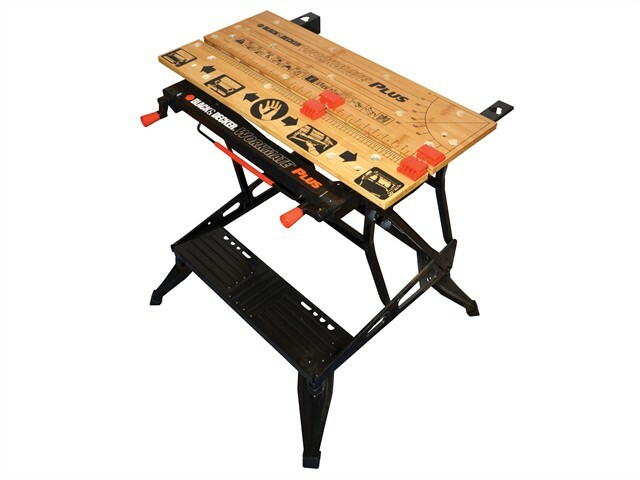 The front jaw swings up for vertical clamping, increasing flexibility to clamp odd-shaped objects with the dual working heights allowing for use as a workbench, bench tool stand, vice, or sawhorse. Its heavyweight steel construction allows support of 250kg and the folding frame allows for compact storage and easy transport with the dual clamping cranks increasing clamping force and versatility. It has adjustable swivel pegs and jaw retention grooves which provide clamping versatility and reliable material hold and has been designed for easy set-up and clean-up with rubber feet which are anti-slip and 3 vice jaw positions for versatility. Vice Jaw Opening: 0 - 205mm. Max Table Width, Jaws Open: 541mm. Folded Size: 830 x 740 x 200mm.